1kg green cabbage, quartered, cored and roughly shredded. or a mix, as you like. 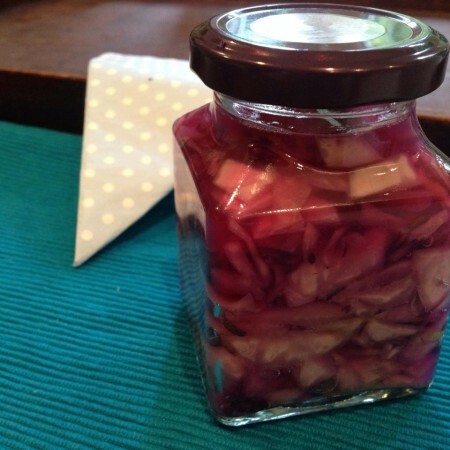 If this is the first time you are making a fermented relish then first have a look at my blog post Basic Tips for Fermentation. You may also like What are the health benefits of fermentation? 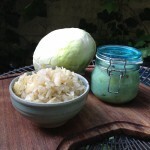 These posts will help you understand the techniques involved in making sauerkraut and other relishes. Then you are free to play. Add the salt to the bowl of cabbage. 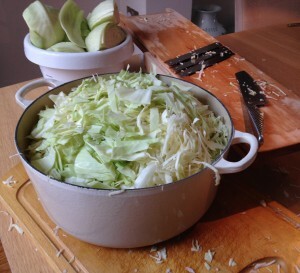 Using a rolling pin or a wooden hammer to pound the cabbage. It is best to time yourself and do this for six to ten minutes. This is a really important part of the process. Put a couple of your favourite tunes on and bash! Add the whey, if using it, and the herbs or spices. Mix thoroughly. Transfer to a wide mouth jar and pack in the mixture. This is another important step. Keep pushing down with a rolling pin or spoon to ensure that you get all of the air out and you are submerging the vegetables in their own juices. Leave a couple of cm space at the top. Seal the jar and leave out for three weeks. You will need to release the gas from the jar by slightly opening the lid, every day or so for the first week. The recipe above is for a basic, traditional relish. Once you understand the process you can start to add all sorts of other vegetables. The relish below is Cabbage, Red Cabbage and Purple Radish. This entry was posted in Front Page and tagged Beneficial bacteria, Fermentation, gut health, Recipes, Whey. Bookmark the permalink.